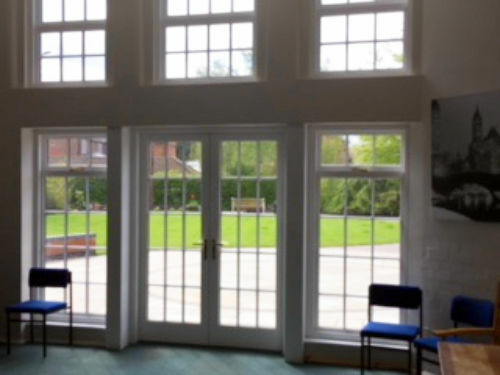 The red brick Edwardian building was the village school until 1968 since when it has been extensively modified and updated throughout with internal decoration in pastel shades and central heating system with pre-set and automatic temperature control. 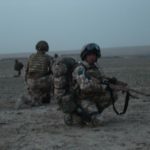 Further details of its history appear under a separate page on this website. Entrance Hall small entrance lobby leading to an entrance hall with a serving bar. Main Hall with a raised stage. Committee Room for meetings, receptions, buffets etc. 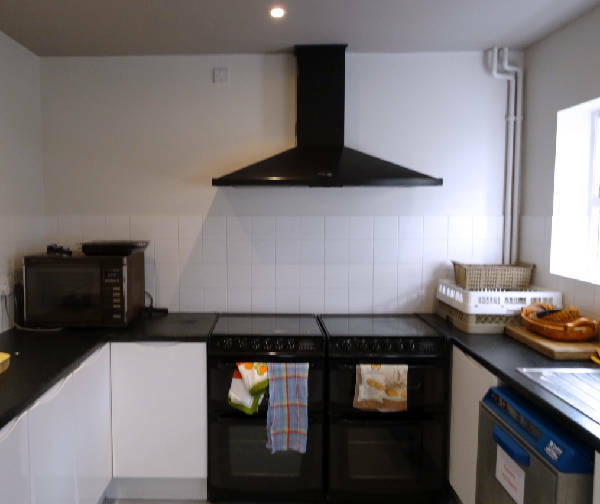 Kitchen Facilities that are fully equipped and approved by the Borough Council. Dressing Room for stage work or temporary storage etc. Toilet Facilities for Disabled, Ladies and Gentlemen which have been completely refurbished. Outside Views various aspects of the Village Hall, both front and rear. A small Entrance Lobby leading to an Entrance Hall with a serving bar, (and with access to the kitchen and storage area). The main and smaller halls lead off the entrance hall. 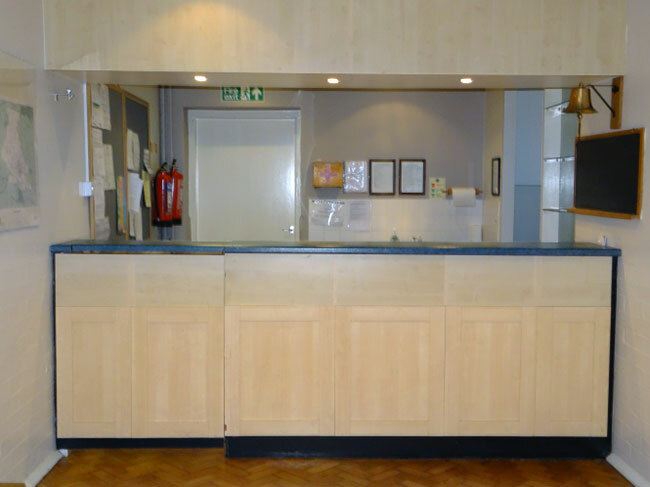 This is the view as the hall is entered showing the serving bar, to the right of which is the entrance to the kitchen. The door beyond the bar leads to the dressing room and storage area. 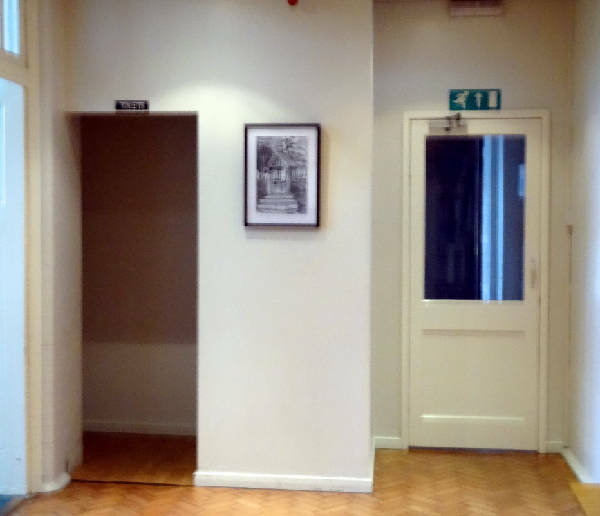 This is a view showing to the right the door from the entrance lobby and a glimpse of the partly open outside door. Access to the disabled toilet is through the inner door and to the left. The hall has three emergency exit doors and a full emergency lighting system. The main and emergency doors are suitable for wheel chairs. To the left the opening leads to the modern toilets. There is coat hanging area to the right of the opening. 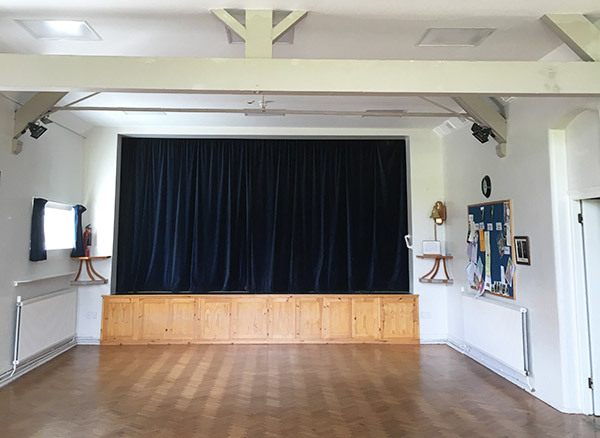 A Main Hall 12.2m x 6.1m (40ft x 20ft) with a raised stage a further 5.28m x 6.1m (17.3ft x 20ft). The room has gracious high ceilings with tall triple windows, and excellent lighting to suit different occasions. A multi-purpose Dressing Room (for stage work) or temporary storage of food stuffs, or imported equipment and the like. The main hall, 40ft long by 20ft wide with its raised stage, fine wood block floor and three tier windows is the main area for larger meetings, celebrations, parties and meals. The stage has a depth of over 17ft, has good lighting and there is a piano. This is ideal for a range of performances and presentations. A Smaller Room (committee, meeting, reception, buffet) 5.8m x 5.8m (19ft square). Again the room has gracious high ceilings with french doors leading out onto a lovely spacious patio area. This a view of the smaller room known as the committee room measuring 19ft square. This room has a hatch into the kitchen and provides opportunity for smaller meetings, receptions, area for a buffet, and for smaller gatherings. A well-appointed modern Kitchen 6.1m x 3.7m, narrowing to 2.5m (20ft x 12ft/8.2ft). 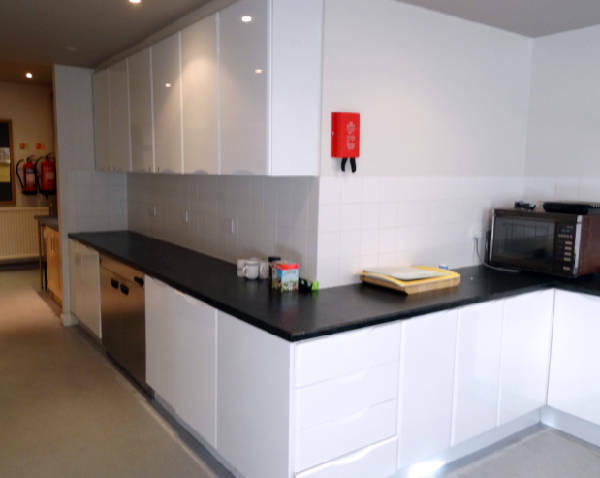 Equipment and facilities comprise a double sink and drainers, two gas cookers, extract hood and separate extract fan, fridge freezer, warming cupboard, and individual glass and crockery washers. There is an ample supply of white china and sufficient cutlery for 72 place settings. The kitchen has been approved by the Borough Council in respect of facilities and hygiene. Two views of the L shaped kitchen. To the left is the food storage and preparation area with immediate access to cupboards at high and low level for retrieving china and cutlery, pots and pans. The warming cupboard can be seen but the tall fridge freezer is just out of sight to the left within easy reach of the bar. A hatch, also to the left opens into the smaller hall. In the cooking and washing area of the kitchen, there are two gas ovens, a double sink and double drainer plus a microwave. The blue topped dishwasher is to the right, partly below the sink. The tea towels provide a dash of colour among the clean lines of worktops and tiles. The kitchen is lighted by rows of down-lighters giving a bright and efficient work space. 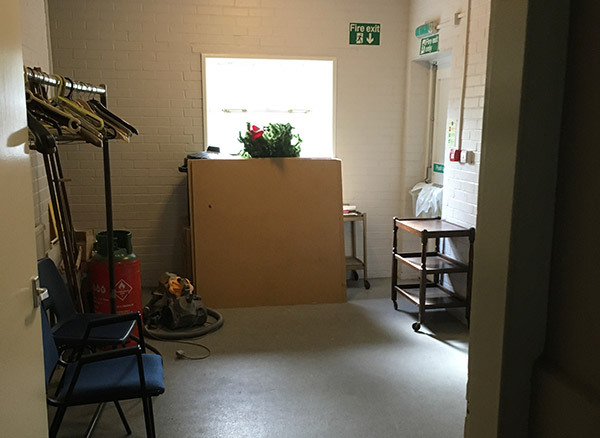 The Dressing Room with direct access to the main hall stage for use with all productions and events being held in at The Village Hall. This a view of the dressing room. Storage Room for chairs and tables to seat 90-100 people. 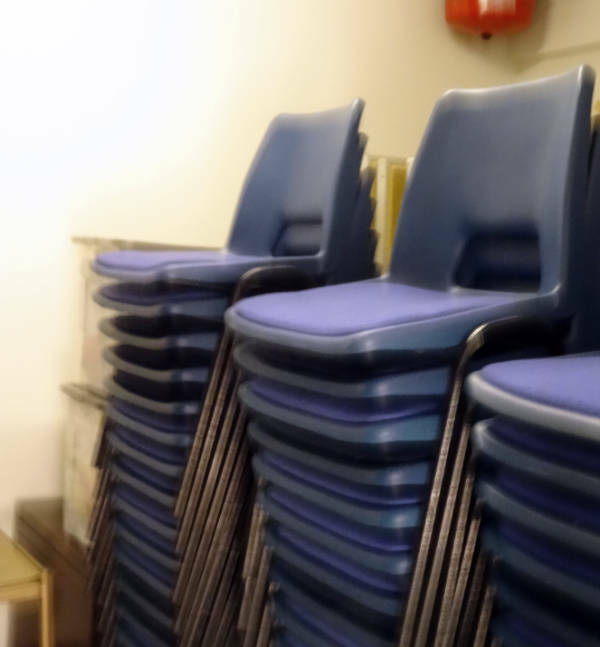 This rather dull and uninteresting picture is a shot into the storage cupboard showing stacks of chairs, most of which sit on small pallet-type wheeled trolleys. A stack of 14 chairs can be wheeled into either hall in a matter of moments, taking much of the physical effort out of setting out and returning chairs to storage. This room also contains 14 large tables (seating 6-8) and 6 small tables (seating 2-4) as well as a number card tables. 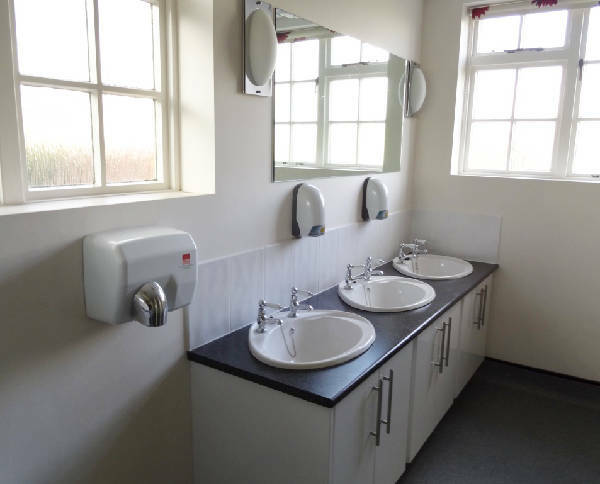 The Village Hall provides modern, well equipped toilet and comfort facilities for Ladies and Gentlemen. 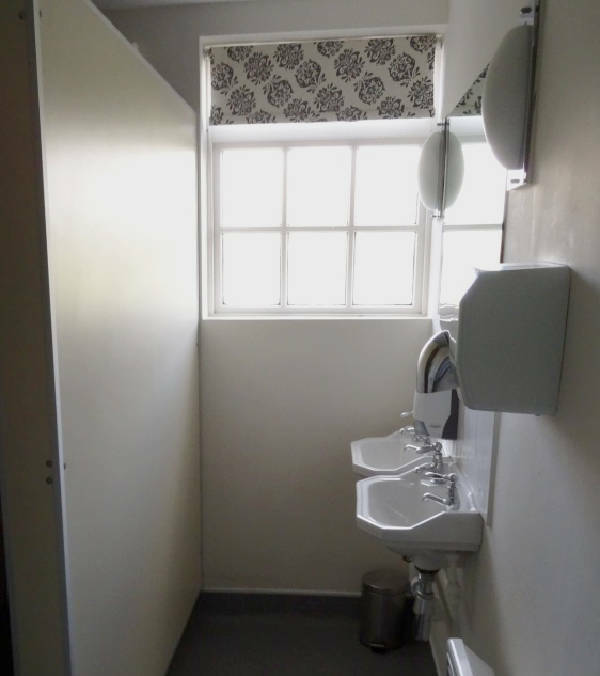 The ladies toilets shown here are bright and airy with excellent hand washing facilities, set at a height to suit adults and children. There are two mirrors one of which is full length. Good lighting should suit every requirement. Pretty blind fabric adds a touch of colour. A view of the gentlemen’s toilets about which little should be said except that the standards are similar to those of the ladies. A long mirror was not considered necessary and the blind fabric is of a more manly design. 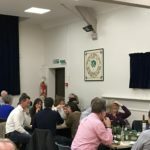 The views from various aspects of the Village Hall, both front and rear. The entrance to the village hall area with Main Street at the end. The hall is out of sight to the left and to the front is the hedge enclosing the front lawn. This view is taken from the car park with the hall just in the picture to the left. 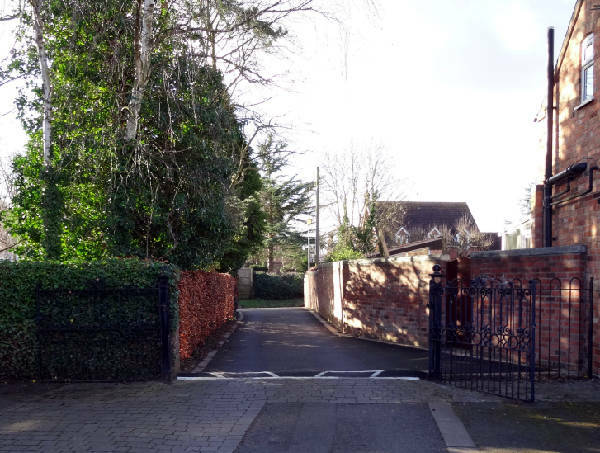 There is room for about 15 carefully parked cars and there is access into or from the hall by an emergency door, again just to the left. The views beyond are of open countryside. 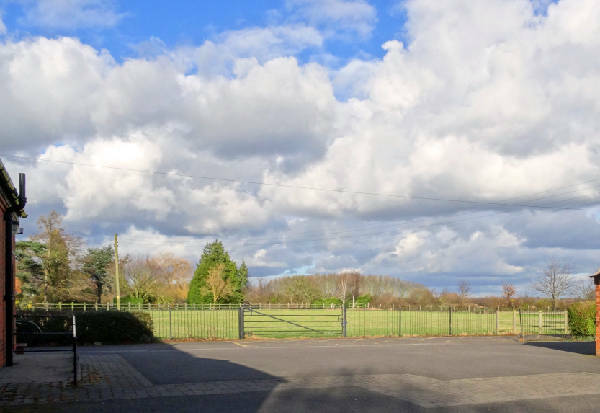 The Sheldon Field, a public space for walking with footpaths to further walks, is just to the right. 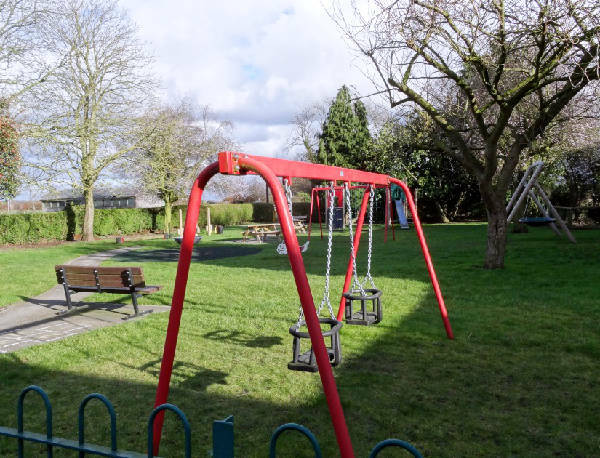 The Parish Council well-maintained children’s playground is to the rear of the village hall with immediate access from the car park.